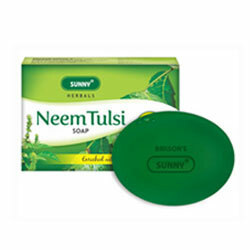 Bakson's Sunny Herbals Neem Tulsi Soap Preventing Acne & Skin Infections, Safe For Rash Prone Skin. Enriched With Neem, Tulsi, Aloevera & Calendula. It is safe for rash prone skin. Enriched With Neem, Tulsi, Aloevera & Calendula.